For this class we wanted to focus on creating a specialty journal. We chose Fall as our theme (because we love it!) but you can choose really anything as a subject. Theme journals are great because they give you a chance to expand upon a subject...give it more than just a spread...fill a whole little book with it in fact. So we encourage you guys to create a little theme journal. Find a book with a unique shape or even make your own from scratch. With a hole punch and a ring binding you can turn a couple pieces of cardboard and some sheets of paper into your own little journal...in just about any shape you please. This might take a bit more time than our past classes but in the end it'll be so cool to have your own, from scratch, theme journal. gather supplies. We wanted to create a special journal specifically for Fall. You can find creatively shaped journals like this at your local craft store. This one we first deconstructed so that it would be easier to work with. We just removed the coil ring binder. You can even make your own journal by cutting heavy cardboard in a half circle and then using it as a template to then trace and cut pages for it. And you can then use a three ring punch and make your own three ring binding. trace shape of cover. We're covering the thick cardboard cover with a faux wood grain paper. So we traced the cover onto the wood grain paper, cut out the paper and adhered it to the cardboard journal cover with decoupage medium. speckle. When the faux wood grain paper was adhered and dry we then gave it a top coat of matte gel medium. Once that was dry we then speckled it with paint. speckle a few colors. We use a #6 round brush...load it with the watered down paint...hold the brush a few inches above your page...and just tap the metal end with your index finger. Do it to your desired effect. We love speckling for it's imperfection. It's messy and haphazard and perfect in it's own way. sand edges. If a little bit of excess paper remains after you adhere your paper to your cover just use some fine grit sandpaper to remove it. adhere floral. We cut out a floral cluster that will be the backing layer to our 3D floral. Adhere with decoupage medium. add wash to edges. This journal will be very earthy since it is Fall themed. So we wanted to give it an antique wash on the edges. Just water down some brown paint and brush lightly along the edge. push through holes. The cover came with holes that fit the coil ring binding. After we covered them over with the faux wood grain we then just poked back through them with the tip of a pencil. stamp & cut out some letters. We love these big foam alphabet stamps. We stamped out each letter on different papers and then cut them out with deckle edged scissors. adhere word and add trims. We adhered the letters, slightly offset, with decoupage medium. And at this point we also adhered the trims with the decoupage medium. gather some 3D elements. 3D elements are great for the cover of your journal. In this case we had a fab vintage millinery flower, some faux leaves, and gold thread. We just love how they look like they're the 3D version of floral cluster that we already adhered down. glue them on. For 3D elements such as these it's best to use a hot glue gun to adhere them. For the gold thread we just haphazardly spooled it underneath the flower so that some would be sticking out from behind. add glue dots. We dipped a glue stick in some decoupage medium and then dotted the medium in a few spots on the cover. You can also use an eraser, a paint brush...We just like the shape and size of a glue stick. glitter the dots. While the medium is still wet, dust it with gold glitter. clean excess glitter. Shake off excess glitter and then if some glitter still remains you can use a damp q-tip to wipe it away. Looks great! As far as the front cover...this looks done! prepare to sponge some paint. Now we've flipped over the cover so that we can do the inner cover. We first gave it a coat of gesso, let dry. When dry we then squeezed out little blops of paint in our Autumn color palette, just randomly spaced and placed. dab & blot your paint. With a piece of a household sponge we then dabbed and blotted until the colors were lightly blended. layer until it looks right. Let these first colors dry...it'll still look semi transparent. Once dry, then add little blops of more color and repeat the sponging process. You'll end up with a varied, mottled backdrop of fall colors. when dry, seal. Let dry and then apply a coat of matte gel medium. speckle. Once again, speckle, and choose contrasting colors. Aqua looks so good on top of oranges and rusty tones. add some rings. One of our signatures...bottle cap rings. simply brush paint on the rims of assorted bottle caps and stamp down on your pages. lay a stencil. Spraying a stencil over top of a mottled background such as this looks so good. grab your mist. We just laid the stencil down and lightly misted the page with Mister Huey's in Classic Tan. mist & remove stencil. Just a light coat...barely there. Gently lift off stencil and let dry. add paint dots. Again, we used a glue stick but this time we dipped it in paint and added dots where we thought dots would look good. Anywhere where pops of color are needed. speckle some more. Again, speckling is a big time crutch of ours. It's a look that belongs almost exclusively to the world of art journaling. We love it. lay out your elements. These elements will pretty much make up the legend for the inner cover...sorta like the title page. adhere elements. Figure out what goes on top of what. It's great to have varying shapes and textures. Lay the elements down piece by piece and adhere them with decoupage medium. Let dry. write some words. Again, this will sorta act as our title page...so we wrote something very fitting for our fall journal. add 3D elements and words. Written with a sharpie pen on white paper, then cut out, and adhered one word at a time. And then frame your words in with bits of trim and 3D elements. punch some confetti. Confetti is our fancy way of adding polka dots. adhere confetti & add faux stitching. Punch out some patterned papers, add dabs of medium, and then just lay your bits of confetti down on the dabs of medium. Since this was the chunky cardboard cover of the journal we used a sharpie marker instead of the sharpie pen to draw on our faux stitching. 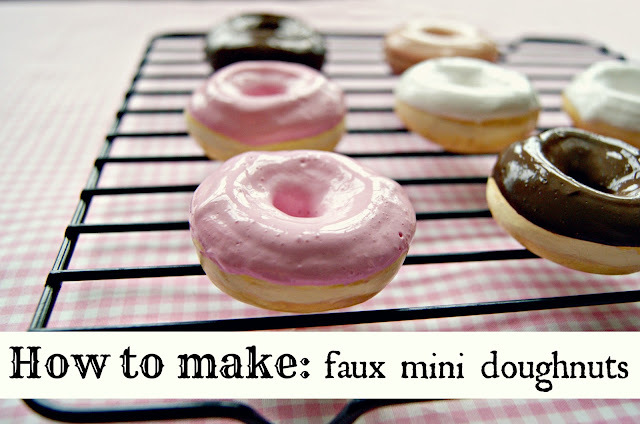 add some washi tape. Washi tape is a must. Such a great detail to add to the top corner of a motif like this. Gives it a scrapbooky feel. looking great! It's got all the colors we're looking for and notice the repetition of the circle theme...the whole journal itself is a circle...so the polka dots and the stencil, and the bottle cap rings all go together so nicely. Love it! As far as journal covers go...this one is a keeper. Hooray! All done...but the Fall Journal has only just begun! 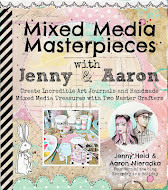 Thanks so so much again for Art Journaling with Jenny and Aaron! We are thrilled to have you here with us each week and this week should be very fun! Again, make sure to leave a comment and link up with us! We can't wait to see your journals and read all about your creative processes. Please grab our badge above and spread the word on your blogs and facebook pages. And again...please feel free to direct any question our way...we are more than happy to help. 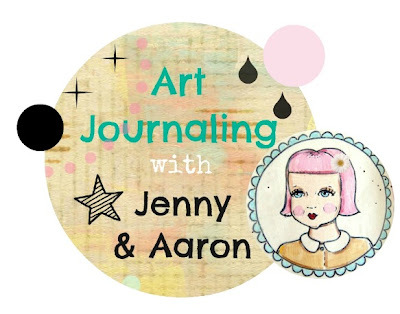 Happy Art Journaling! Gorgeous!! I loveeeeeeeeeee the shape and the colors you incorporated!!!! 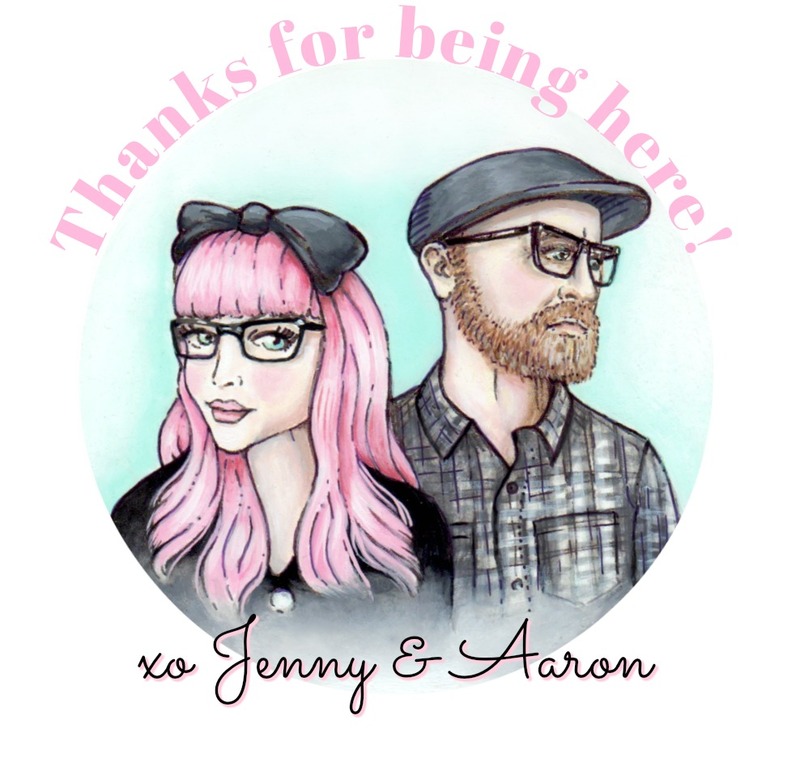 Love this autumn journal, Jenny & Aaron! 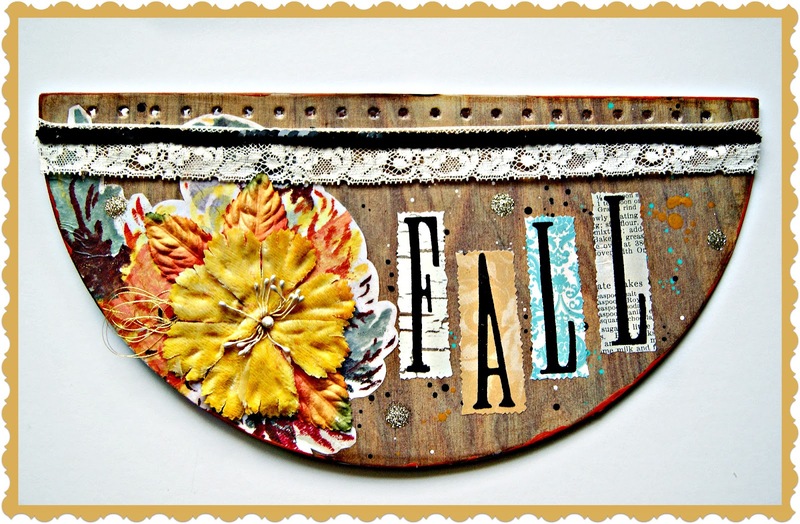 The shape is fabulous--and autumn is DEFINITELY my favorite time of the year, as well--certainly deserves it's very own journal...great idea! As always--thanks so much for sharing your talents & wonderful ideas...you're always an inspiration! i just feel like telling you both again, how awesome you are. i'm serious. fall is my favorite season too. The trees are really starting to gain momentum with their leaves changing here. I think I'm going to have so much fun with a journal dedicated all to autumn. I can't wait. Here's the link to my pages from this week. Thanks so much for visiting me today! I too wished we lived closer so we could journal and play! Love your style too. Hope you're having a wonderful week. I'm still patiently waiting for our Fall to arrive. Might be another month at least. 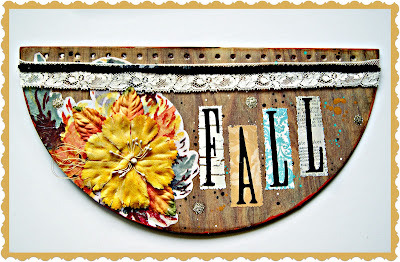 Fall is all the rage on blogs these days! I never knew so many people loved fall! Funny, it was only this year that I started to like it myself. Then again, here it seems like summer just arrived late, so it's still summery out! =) Beautiful page! I love how different it is from your other pages - it's fun to see you branch out! I found my art journal and hope to find some time to finish up & post another page (FINALLY) this weekend! @teddi Geez Thank you SO SO much!! So happy to share! :) Thank you for visiting and for your kind words! @Kay Ellen So so lovely of you to visit. Gosh thank you so much! Geez...the feeling is mutual! You are a total sweetheart! :) We hope to see you at another fab event one day soon! @Kelsea haha I knooow..well I "blame" pinterest for all of the "inspiration"...it spreads like WILDFIRE! haha...pumpkin crazed bloggers! :) Well I''m guilty of being a pumpkin nut since childhood. I LOVE pumpkin pie!